Wild bird parents have an easier job than human parents do. It’s virtually impossible for any bird to reach adulthood whose parents didn’t do an appropriate job of raising it. Bird parents provide their young with food and protection, keep their nest tidy or lead the chicks around on the ground, and teach their young the basic life skills they’ll need for survival. Although this takes virtually every waking moment during the time the babies are dependent, bird parents don’t show a speck of impatience or anger, and never hurt their babies. Somehow we humans have evolved, or perhaps devolved, so that many of us reach adulthood after being raised in horribly inappropriate ways. Some adults simply cannot nurture, or are overcome by impatience and anger, or in other ways damage their children, yet the children survive to raise children of their own. And whether child-rearing is more a product of nature or nurture, the offspring of parents who raise their children badly are likely to inflict these bad parenting skills on their own children. Many of us who were raised in abusive homes know exactly how we don’t want to raise our own children, and when everything is going well, we can be pretty darned good parents. But at the end of the day, when the spaghetti is boiling over while we’re in the midst of a diaper emergency with the baby and our toddler falls on the hardwood floor while the four-year-old drops a half-gallon glass jug of milk on the kitchen floor, it’s easy to fall back on instinct. That’s why I was terrified to become a mother. I was confident that my children wouldn’t be covered with welts and bruises as I was, but I also knew that when I got frazzled, I couldn’t trust my instincts. Fortunately, when my first baby was six-months-old, I discovered Mr. Rogers. Every day Joey and I would snuggle on the sofa and be welcomed into the neighborhood of this gentle, soft spoken man. Joey giggled and smiled at John Costa’s rich and whimsical piano playing and Mr. Rogers’ colorful puppets while I learned by Mr. Rogers’ example how to be a gentle, kind and patient mommy. Joey was an easy baby, so I had plenty of time to absorb Mr. Rogers’ ways before I found myself the mother of three small children and motherhood became more demanding. I wrote him in 1992 to tell him how grateful I was to him for showing me how to be a mother. And he wrote back a lovely personal letter which I’ve always kept on the wall near my desk, a treasure that reminds me who gave me the best part of myself. Mr. Rogers’s voice was ever soft, gentle, and low, like the call of a Resplendent Quetzal. Like a quetzal, he was a vegetarian. Male quetzals have a brilliant red underside, rather like the bold red sweater Mr. Roger’s mother knitted for him that he often wore on the program, and like Mr. Rogers in his red sweater, a quetzal manages to quietly blend in with its surroundings, while making its own neighborhood a lovelier place just by being itself. A male quetzal’s flamboyant uppertail coverts are fancier than anything Mr. Rogers wore, but as he often sang, some are fancy on the outside, some are fancy on the inside. He was authentic, and if he was sweeter than some people could abide, it was authentic sweetness–the kind that can nurture a hummingbird. 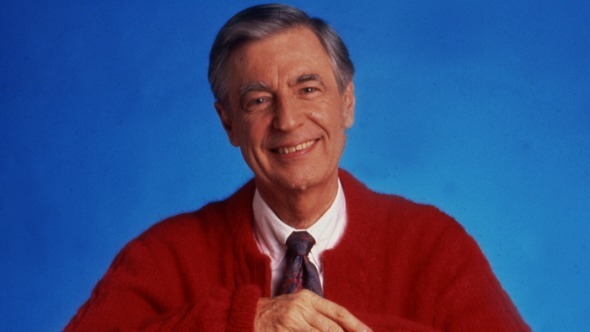 Mr. Rogers left this planet a better, more neighborly place for all of us by just his being himself. Now it’s time for the adults among us to follow his example and work to make this world a safe, nurturing, and lovely neighborhood for children, animals, and one another. Mr. Rogers closed that commencement speech with these words: “When I say it’s you I like, I’m talking about that part of you that knows that life is far more than anything you can ever see or hear or touch. That deep part of you that allows you to stand for those things without which humankind cannot survive. Love that conquers hate, peace that rises triumphant over war, and justice that proves more powerful than greed.” Whether we are a Resplendent Quetzal or a sparrow, a hummingbird or an eagle, let’s follow his example and keep Mr. Rogers’ spirit alive and our planet neighborhood filled with beautiful days.